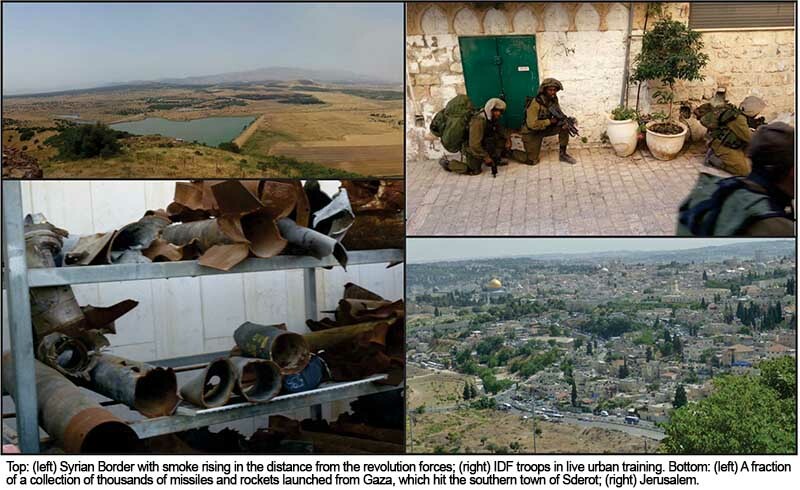 Top: (left) Syrian Border with smoke rising in the distance from the revolution forces; (right) IDF troops in live urban training. Bottom: (left) A fraction of a collection of thousands of missiles and rockets launched from Gaza, which hit the southern town of Sderot; (right) Jerusalem. ‘Astounding’ I thought, as I looked through my plane’s window, glancing from the horizon of dawn to the shadowed sands of this small piece of desert. I couldn’t believe that this is what humans have been fighting over for thousands of years. I understood that I was landing in one of the most geopolitically volatile regions on the planet. We walked off the plane, and were immediately greeted by six soldiers who were to accompany us on our journey. My first impression was that they were joining us for our own security, but then I realized that they were just coming on the trip to learn and bond. Although we did have one armed security guard on the trip, I was relieved to see that six would not be necessary. To which Chen replied “I used to worry about these things when I was 15...I was a little depressed, but I stopped thinking about it, because worrying about it didn’t help me.” This was an interesting attitude to such a question, but it was also a conversation one was not likely to hear by the office water cooler in America. I came to see this as the Israeli attitude to most dilemmas, in that deliberation was wasting potentially precious time. I was slightly taken aback. As far as politically incorrect statements went, that was probably one of the most un-PC statements I had ever heard. It was in this moment that I had realized the dangers of oversimplifying political situations. The use of the word penetrating was rather graphic as well, and one could see how trying to use simple justifications such as this may easily upset the international community. Birthright took us to every touristy place, but I needed more. I had spent two weeks in Tzfat sleeping in the mountains out under the stars, and living with the amazing orthodox community; most of which were from America or Russia. I learned of some of their values, such as no touching before marriage, and how keen they were on supporting a strong family life. I then spent two weeks at a Yeshiva, where I met a man named David, who traded many millions on the stock market in the past several years. He gave much of that lifestyle up in order to move to Israel, purely because he wanted to experience true spirituality, and did not find the deep meaningful happiness he expected from his success. For the last four days of my trip, I returned to Tzfat to participate in the Livnot U’Lehibanot program - A program that takes its participants on beautiful day and night hikes, and also brings them to take part in community service to fully restore this ancient, mystical city. It was on my last night that I spent in Israel that we went hiking in the Golan Heights, and spent a night sleeping within eyesight of the Syrian Border. I laid out under the stars and saw the milkyway for the first time, and as I gazed upon the millions of stars that were billions of miles away, I began to wonder about my own purpose here. All of our petty differences and worldly affairs seemed so minuscule in this moment of space and time. I slowly began to close my eyes and fall into a daze, when the air abruptly shakes - an explosion from the Syrian revolution rocked the very earth around me. I boarded the plane to leave the next day, and deep in my heart I felt the need to come back. With all of Israel’s problems, there is nothing that cannot be fixed, and there is a special happiness pervasive throughout the people which I had never found in the U.S. I wasn’t ready to leave, and as the plane began to leave the runway, and as we rose above the Earth, I knew I never would, and a part of me never did.